My husband drops me off at Durlston Country Park. We were planning to have breakfast in the Visitor Centre cafe but it is not open yet and I am too impatient to wait. With no village or pub on the route today, I have brought a snack for lunch. I will eat it for breakfast instead. I head down the track towards the Anvil Point light house. 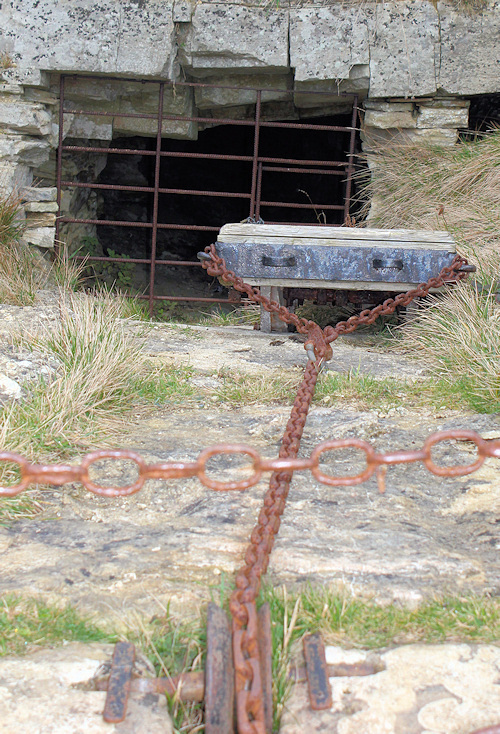 I pass some old quarry workings, complete with a truck on a rail track and with the pulley system used to haul up the Purbeck stone. Many of these quarries were mined by the families who owned the land and dug out the stone with pickaxes. 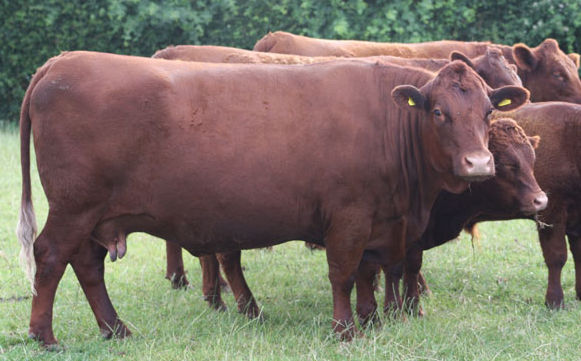 Everybody, including children, was expected to help in these dangerous family businesses. For some reason, I am feeling anxious about the walk today. I am unfit after a winter of inactivity. 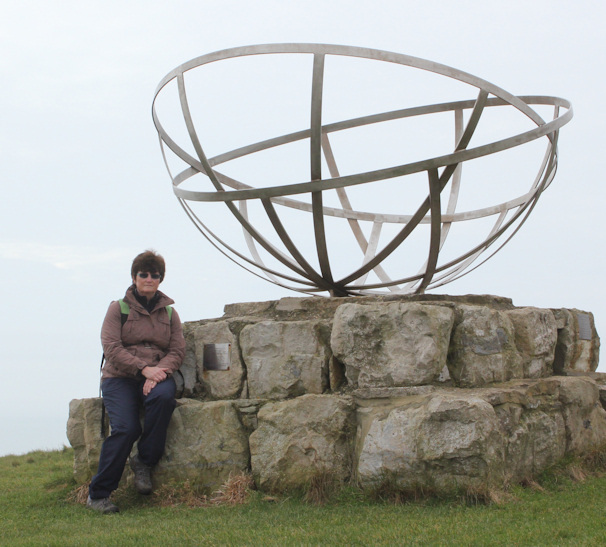 I am used to walking on flat land – Ballard Down above Swanage was the first major hill I had come across since Sussex. Everyone has told me how rugged and difficult this section of the South West Coast Path is and how the route is steep and narrow and with treacherous drops. There is nobody about and I am relieved not to see fit walkers with huge rucksacks. On the other hand, perhaps the lack of people is an ominous sign. Once I start, there is no easy way off this section of path until I arrive at Worth Matravers. According to my map, it is only 8 miles. But will I be up to it? 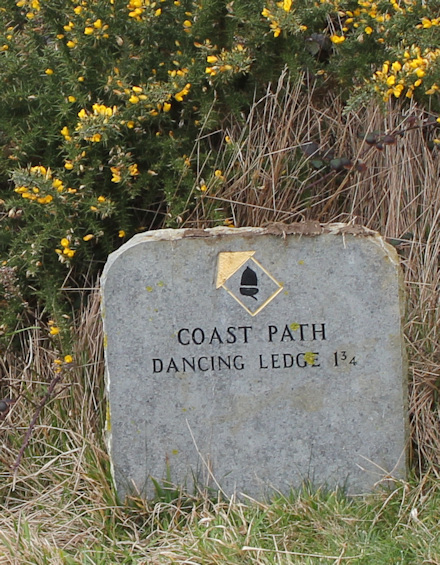 This little marker stone points the way to ‘Dancing Ledge’. What a lovely name. I must regain a positive attitude – this is going to be fun. I check my phone and make sure it is fully charged. The view of the coast is not promising. The sky is dull. 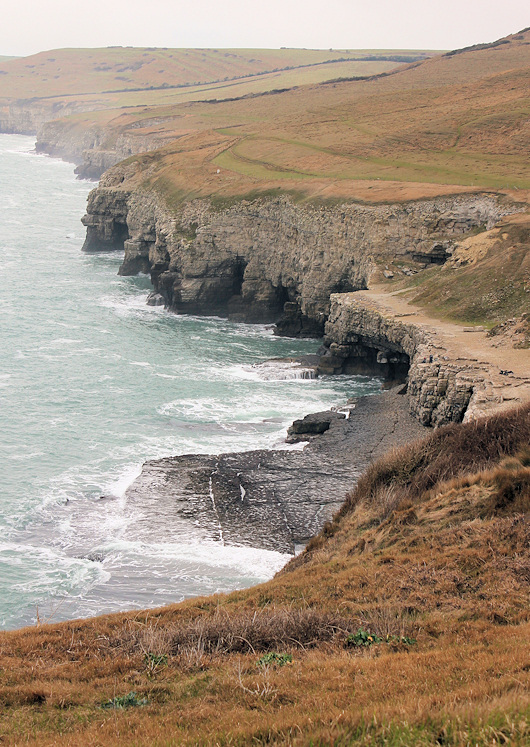 Ahead I see a high promontory of land – marked on my map as St Aldhelm’s Head and also know as St ALban’s Head. It has a mass of cloud sitting on its shoulder. As I progress, I watch this bank of cloud, hoping it will clear. It never really moves – just ebbs and flows, up and down, moving gently but never moving on. Suddenly there is a frantic flurry of activity in the gorse bushes alongside the path. Something large rises up and bounds away. I am worried it is going to hurl itself off the cliff, such is its panic. 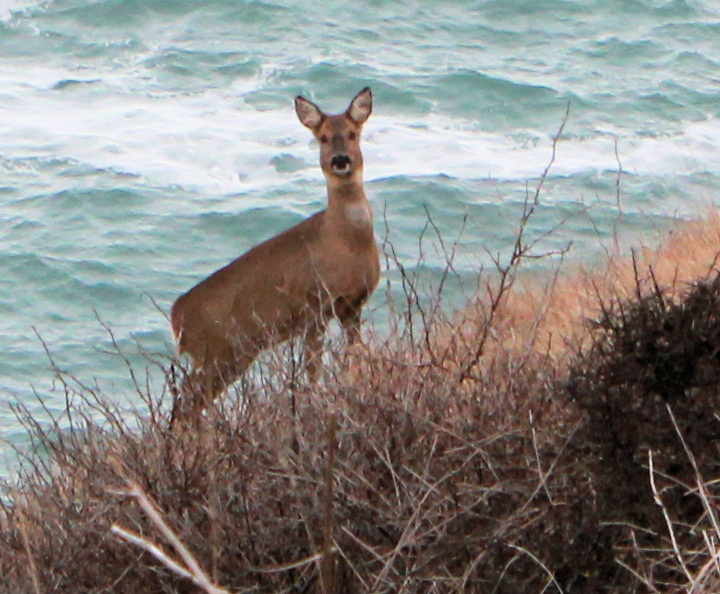 But it stands very close to the rocky edge, behind a protective barrier of bushes, and watches me with nervous eyes. The path does wind up and down, but never too steeply. I relax and begin to enjoy myself. Ahead, down at sea level, I see ledges of rock with the waves swirling and breaking over the stone outcrops. There are caves. 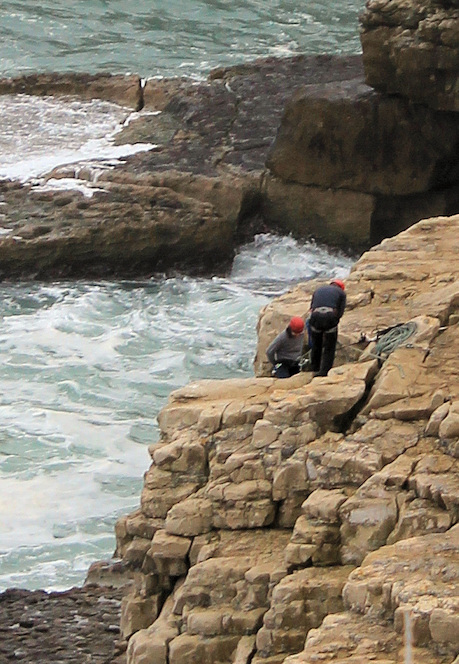 And I see people – climbers. This is a climbing paradise – rocky cliffs, fossils, caves, old mine tunnels. Further on, I come to a place called Winspit. Here a gully formed by a stream runs down to meet the sea. There is a fierce sign, warning me that if I die it is not the fault of the landowner. You don’t get the full-scale of this sign from the photo. It must be about 10 feet high. Designed to be unmissable. There are a few people here, walking. They haven’t been doing the coast walk, but came down from Worth Matravers, the village above the gully that leads down to Winspit. 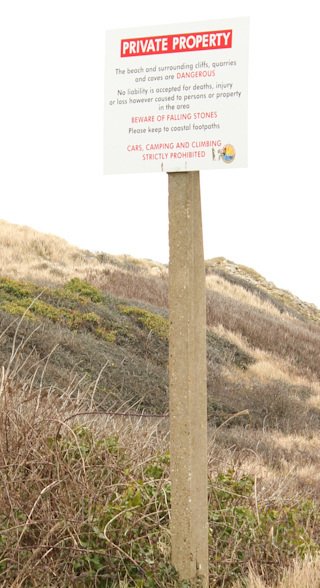 Beyond the sign is a collection of half-ruined houses and old quarry workings. I later learn that several episodes of Dr Who were filmed here. And Blake’s 7. There is a stone seat perched precariously above the ruins. I sit there for a while and eat a late breakfast – or an early lunch – and watch the sea crash and thrash at the rocks below. From Winspit, I make my way upwards as the path climbs up to the peak of St Aldhelm’s Head (or St Alban’s Head, if you prefer). Now I enter a misty environment. I can just about make out the lookout hut at the top of the headland. But the views are spoilt and I am disappointed not to be able to get some great photographs of the route behind or the view ahead. Just below the headland are more old quarry workings. This amazing monolith has been left standing. At first I think it is natural. But later, on looking at the photographs, I think it must have been deliberately created, maybe by the miners. 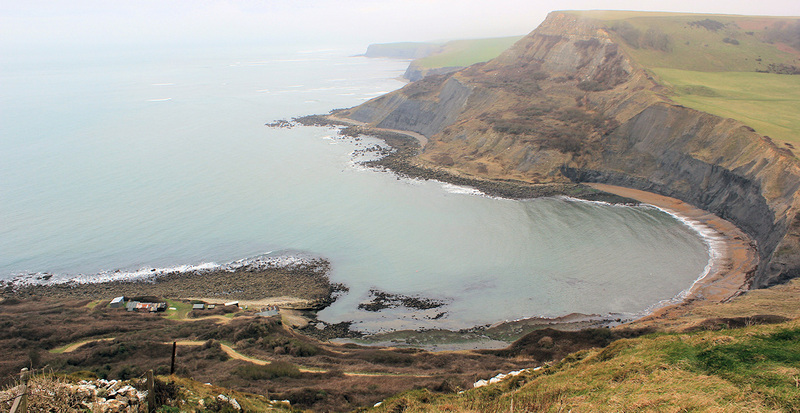 Above the quarry is the green swathe of land – St Aldhelm’s Head itself. In the mist, I can see the lookout station – manned by volunteers – I arrive just as they are changing shifts. And here is something strange. A semi-circular, cage like structure. As I get nearer, I realise it is a monument to the Radar Scientists, unveiled by Sir Bernard Lovell in 2001. Purbeck was an important site for the development of radar during World War Two. I sit at the base of the monument and think of how the Battle of Britain was won by our few, brave pilots – pitted against the mighty German air force. And how radar played an important role. Radar was our secret weapon. Being able to spot German planes in advance led the Germans to believe we had far more planes than really existed – because wherever they chose to send their bombers or fighters across The Channel, we seemed to have plenty of planes in that area waiting for them. They didn’t know how vulnerable and defenceless we really were. I set the timer on my camera and take a self-portrait. Because of the mist, I have been unable to see much of the route ahead. So I am taken by surprise to find the land suddenly falls away. Steep steps lead down the hillside and, on the opposite side of this steep, narrow valley, another flight of steep steps leads upwards. I wish I had my walking poles. I consider walking around the valley. There is a farm track that skirts it and takes me straight up to Worth Matravers. But I decide that would be cheating. Down I go and up again. On the way up, tired and hungry, I make a pact. If I climb up twenty steps I can rest for twenty seconds. If I climb up thirty steps I can rest for thirty seconds. As I approach the top, I am down to ten steps and a ten second rest. But the climb is worth it. At the top, with less mist around, I have a wonderful view of the beautiful Chapman’s Pool. This is an unspoilt cove, with just a few fisherman shacks. There is no easy access by car. There is no development. Lovely. I walk along Emmetts Hill, above Chapman’s pool. The path is narrow in places with a steep drop. I meet a few other walkers, including a group of middle-aged people out with their dogs. I worry the animals are going to fall off the cliff. 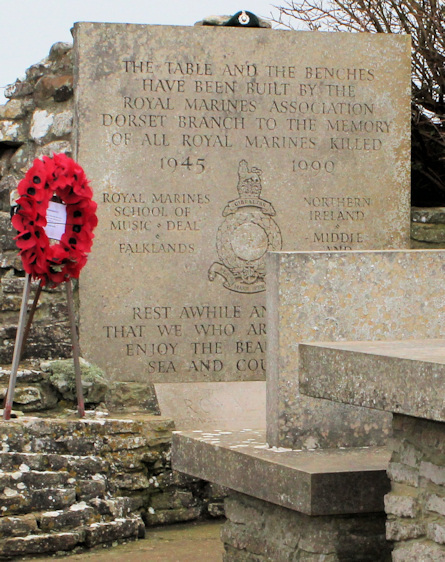 There is a memorial to The Royal Marines up here. It is a lovely setting. There are tables and benches made of stone. It would be a pleasant place to have a picnic. Unfortunately, I have no food left. 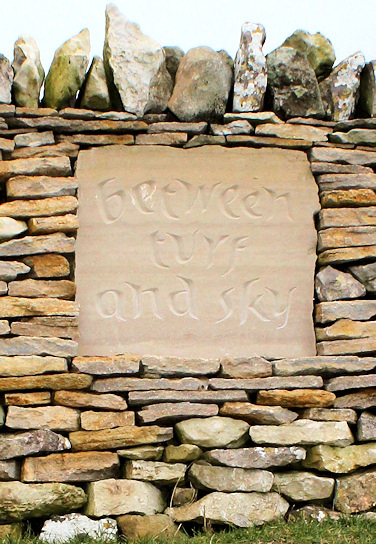 A dry stone wall runs along on the landward side of the path. 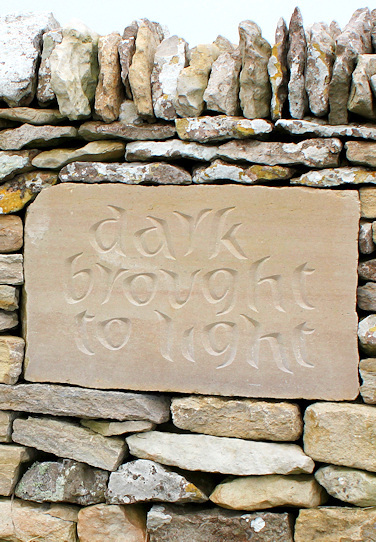 I notice that it contains some larger Purbeck stone pieces with carved words on them. These carry very brief, poetic, statements. 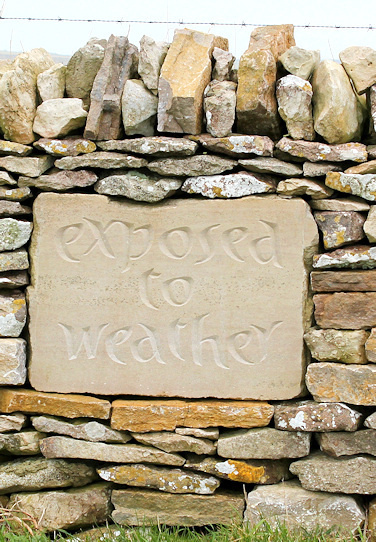 Later, I try to find out more about these stones with their inscriptions. 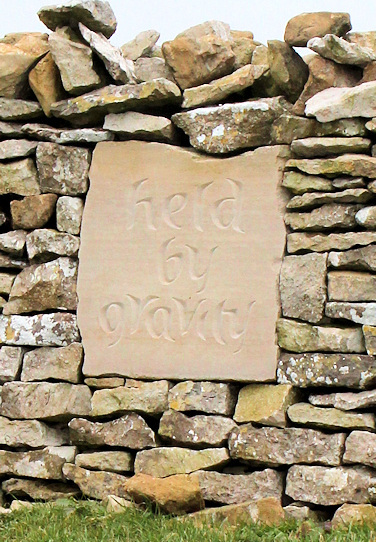 They look very modern and freshly chiselled. On the Internet, I find comments made by other walker and photographers, but nothing official to explain the stones or their origin. I wonder if they are part of the memorial to the Marines. Beyond Chapman’s Pool, the path leads down to an aptly named collection of houses – Hill Bottom. From there, a private road takes me back up the hill towards Worth Matravers. I am tired now and progress is slow. 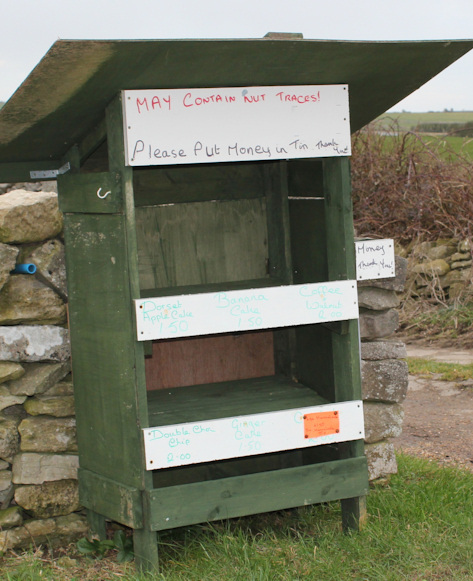 I pass a few farms and see this roadside vending station. Cakes for sale. But they are either truly delicious and all sold out, or not yet baked. The shelves are empty. Perhaps it is just as well. I am hungry and wouldn’t have been able to resist a cake or two. 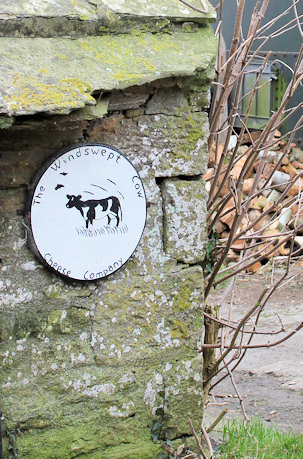 Beyond the cake stand, I spot this sign for a cheese making creamery – “The Windswept Cow”. There is something very endearing and pertinent about the name. This has been a walk with plenty to see and, despite the poor views, I have taken some interesting photographs. Most importantly, I have survived the rugged path and not found it too difficult. I am looking forward to tomorrow. 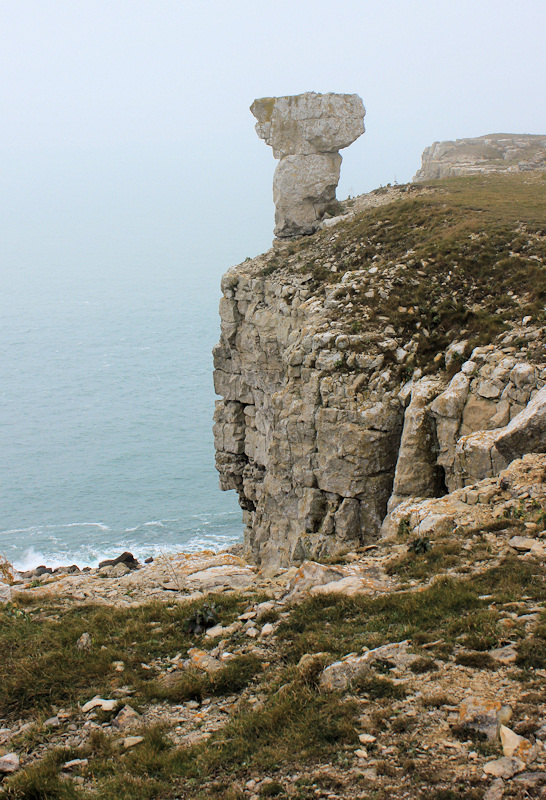 This entry was posted in 08 Dorset and tagged britain, coast, photography, travel, walking. Bookmark the permalink. Sounds like it all went well in the end. Keep going! We’ll see you in Southport, or North Wales! What luck to see the deer! Did you go down to Chapman’s Pool and get a fossil? Thanks for the journal – it is always great reading. Those steps are quite a surprise, aren’t they? I felt a little like I’d been ambushed by the terrain when I did them. Thank you Roger. Interesting to read when and how the stones were put in place. I’ve just started reading your blog which is fascinating, particularly as a friend and I walked this particular stretch in July 2013. When planning the route we didn’t see where we could stay between Swanage and Lulworth Cove and so thought we could do it all in one day!!! How foolish we were! We had stayed in Swanage and left around 9am. Beautiful weather and scenery. All went well until those steps!! I had a slight groin injury and they just finished me off. I couldn’t lift my left leg high enough and so had to use my right leg first and then drag the left. Managed to get to the lookout eventually but had to make the decision to acknowledge defeat and make our way to Worth Matravers as we didn’t think there would be another point where we could go inland. We were booked into Lulworth Cove that night. It was a Sunday. The only transport was a taxi which cost £40 and to add insult to injury we passed Corfe Castle which we had visited the day before en route to Swanage and it seemed that we hadn’t actually achieved anything. However I did manage to continue. We walked to Durdle Dor and back on the Monday and then caught a bus to Weymouth and walked all around Portland Bill on he Tuesday. Even without my injury there’s obviously no way we could have completed our original plan in one day. Can I ask which blog site you are using please? Meant to say, this was an original free WordPress.org site, with an upgrade to remove advertising and have my own domain name.